Hi, I am interested in your 1940 Ford Other Ford Models (stock #4707-ATL) listed on Autotrader for $32,995. I'd like to get more information about this vehicle and confirm its availability. A great blend of vintage authenticity and skillful customization, this 1940 Ford Coupe Streetrod is one timeless classic. It features a very cool exterior color draped over a sturdy steel body thats well-equipped to stand up to both time and use - you wont find any warpage or stress cracks on this one! As the 40s approached, the Ford Coupe took on an increasingly more muscular shape, with a dominant, flat hoodline and signature, three-piece Deluxe front grille on display here creating a combination that would prove irresistible to streetrod enthusiasts. This Coupe is dressed in a nice looking Burgundy metallic shade ornamented by blue flames on the hood and wears an assembly of trim and bright work that sits securely in place and seems very solid, though some chrome polishing here will no doubt sharpen things up. Its got such a distinctive, stylish shape, with its compact cabin looming over a stout form and that level hoodline up front contrasting with the slope of the deck lid in back and the sturdy steel construction will really pay dividends in the long run. The foundation underneath has performed its duties well - theres no sagging to be found and body panels on this classic really line up well. Theres a sharp looking cloth interior waiting inside the doors, at the center of which is a pair of plushly padded buckets that are in good shape and sit over an expanse of unblemished carpeting. To each the side, the door panels are very well-fitted and their textured surfaces feature commemorative 40 imprints and clean looking hardware. A flame-ornamented billet steering wheel takes its position on the tilting column and the dash area just beyond it is outfitted with off-white Dolphin gauges that look great inside their chrome panel. Under dash vents are in place to bring cooled air into the cabin, and the air conditioning system will require only a condenser and hose to be brought back online. Audio comes via an AM/FM/CD stereo that pairs with Pioneer speakers. In back, the trunk area is in solid condition and offers ample storage space for weekend outings, which are a definite option when you factor in Coupes very solid running condition. This vintage Ford stands ready for action just as soon as you get it home. Its outfitted with a 350 cubic inch V8 that carries an Edelbrock 4-barrel carb on top and is really running strong. The engine has been dressed up with a chrome air cleaner and valve covers, with a fresh set of Excel plugs teaming with an added HEI ignition to bring maximum voltage to the spark plugs. The 4-speed automatic 200r4 transmission just behind it offers the decided advantage of an overdrive gear to bring RPMs down at highway speeds. The featured Mustang II front end brings with it a number of features that really up the ante as far as drivability is concerned, including coilover shocks, power disc brakes that team with the pair mounted on the 9 Ford rear end, as well as power rack and pinion steering thats nice and precise. This streetrod patrols the asphalt on a set of 15 Gray American Racing rims outfitted with Uniroyal Tiger Paw tires. Below, the undercarriage appears very solid and from that vantage point you can see the cross bracing on the frame used to increase its structural rigidity. 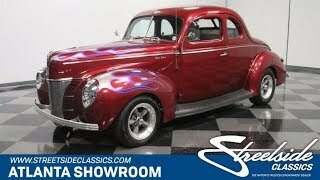 With its amplified vintage style, plentiful power and well-chosen collection of upgrades, this 1940 Ford Coupe Streetrod is both quite a looker and a blast to drive. Call today!